Mayor Rahm Emanuel and Ald. 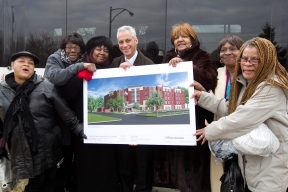 Michael Scott Jr. (24th) joined North Lawndale seniors and community leaders to start construction on a new 120-unit, supportive-living complex at 4339-47 W. 18th Place. Montclare Senior Residences SLF of Lawndale includes a mix of studios and one-bedroom units as well as activity rooms, a wellness center, laundry room, beauty shop, outdoor patio, landscaped courtyard and on-site parking. Residents will receive help with personal care and daily activities, including housekeeping, meals, recreation, and health and wellness services. 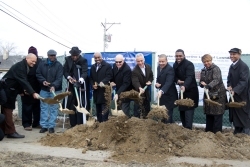 The project is supported by $2 million in Tax Increment Financing (TIF) assistance from the city of Chicago. Additional city support for the $27.6 million project includes Low Income Housing Tax Credits valued at $10.2 million, a $3 million loan, and the $1 sale of city-owned land. HUD transferred the land to the city at no cost for redevelopment and financed the 108-unit development with a HUD insured mortgage of $12.3 million. One hundred and eight units in the building will be available to seniors earning up to 60 percent of area median income; $31,920 for one person or $36,480 for two. Twelve units will be leased at market rates. The five-story, L-shaped building by MR Properties LLC is part of the city’s Five-Year Housing Plan to commit $1.3 billion in public and private funds to build, rehabilitate, or preserve 41,000 units of affordable housing by the end of 2018.